If you've visited either of the Disney worlds, you’ve no doubt experienced The Pirates of The Caribbean --- well, here is its motion picture counterpart --- every bit as artificial as Disney's indoor sail through pirate waters. I’m convinced this movie was a direct forerunner and inspiration for the ride, as they're both deliberately overblown and kid-friendly. 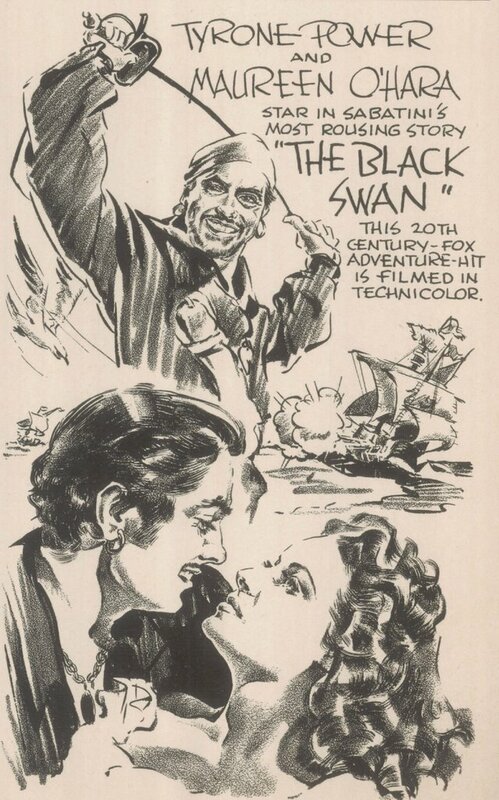 Zanuck conceived The Black Swan as schoolboy pirate adventure from the beginning --- opening scenes announce as much. 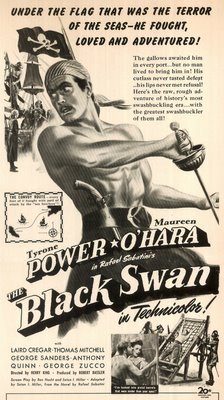 Whereas the Errol Flynns functioned as straight period drama, this one casts a wink toward the audience from the first reel on --- even Power's own Son Of Fury, released within the same year, managed an intensity never approached by The Black Swan. I remember waiting with great anticipation back around 1980 when it resurfaced on the old "SFM Holiday Network" after having been years out of circulation (except for a few scattered B/W prints in 16mm). It seemed a letdown then, and compared with The Mark Of Zorro and Son Of Fury, frankly still is --- yet somehow, The Black Swan seems to gain on repeated viewing, and for that reason, I’d recommend it as a video keeper. Two elements alone justify ownership --- the color and Alfred Newman's score. Otherwise, there is a miscast George Sanders --- I know it's hard to imagine G.S. as an unwelcome participant in ANY film, but he's just too urbane for athletic excesses he's put through here (George was notorious for ducking stunt work) --- and that flaming red beard too often conceals the beloved Sanders sneer we know to lie beneath --- this one's clearly among the actor's "take-the-money-and-run" parts. 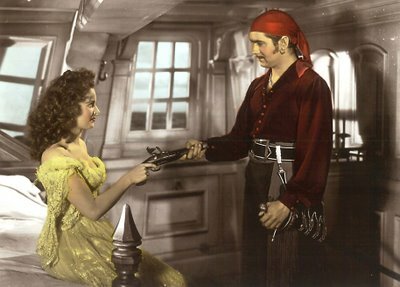 Director Henry King was ideally suited for Americana subjects (see the wonderful Margie and Wait Till The Sun Shines, Nellie), but was versatile enough to hoist the Jolly Roger when necessary, though you sense he'd rather be doing something else. 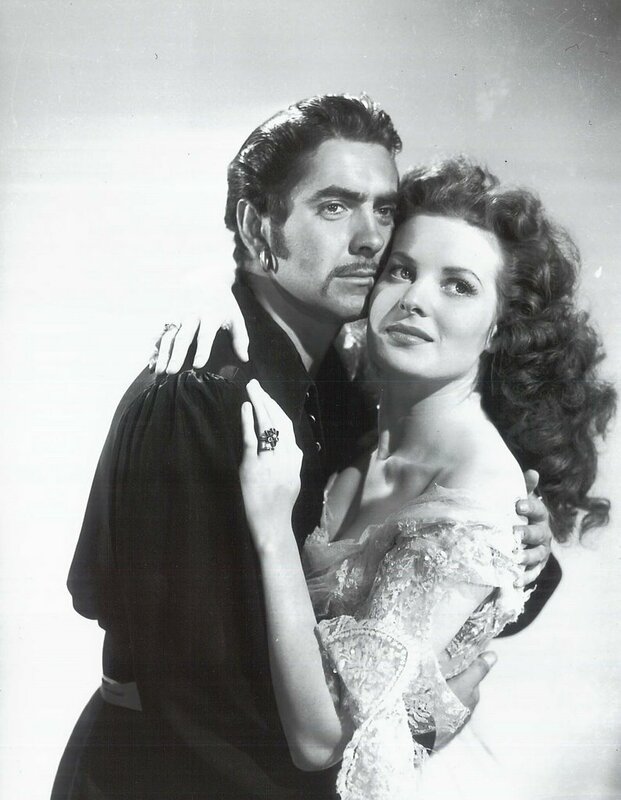 Maureen O'Hara's the usual spitfire (she even got around to playing a character named Spitfire a few years later with Errol Flynn) --- you wonder why these guys put up with so much aggravation to get at her --- then that fadeout clinch, surprising for a code pic, comes along to remind you. She and Power also do a bedtime variation on the old It Happened One Night gag that is actually the most suspenseful scene in the show. 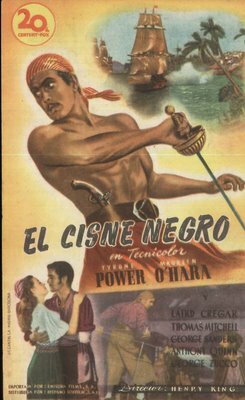 Don’t get your hopes up for a Zorro worthy climactic duel --- here it's undercranked and ludicrous --- like running a silent at the wrong speed. Tyrone Power was peeling potatoes by the time this got into theatres --- he'd never look so frisky again --- even in similar post-war projects, it was clear the party was over --- just compare Swan with Captain From Castile --- same star, color, director, composer --- but now the milk had curdled, and a noirish malaise had definitely set in. Power may have looked back on the Black Swan(s) of his past as childish unworthies (or "monuments to public patience" as he liked to call them), but this was the sort of vehicle that took him to the top, and would have kept him there, had the war and his own displacement by newer faces not occurred (think Burt Lancaster and The Crimson Pirate, virtually a remake of The Black Swan). In a sense, it’s Power's own swan song as the impossibly handsome matinee idol --- a status he would soon exchange for a marine uniform, and never really get back. Fast forward to 2006 and another viewing of The Black Swan. These are not very dangerous pirates. They seldom do anything piratical. All of them talk about it a great deal, describing horrific acts of pillage and mayhem that have taken place offscreen, if at all. "Your fulminations, my Lords and Gentlemen, are filled with bilge and blather," says Laird Cregar, and indeed, this show is rich with fulmination --- never have I heard so much fruity and high-flying dialogue as this. At times it’s exhausting. Laird waxes eloquent on the subject of tearing out Power’s gizzard and hanging it from the highest yardarm, then tells Maureen O’ Hara how he’ll soon see Power dangling in chains from an even higher gibbet. Nothing remotely as violent actually happens in the movie, and certainly nothing in the behavior of any character suggests it will. The Black Swan is itself a lot of bilge and blather, but enjoyable none the less, if only for being on and off in 85 minutes (I understand the new Pirates of The Caribbean sequel runs 150 minutes, including four or five apparent endings prior to the actual one). I will say Laird Cregar is absolutely resplendent in period attire. This man could have lived and prospered three centuries ago, I have no doubt of that. Maybe someone should have taught Ty that No Means No insofar as his dealings with Maureen --- she gives a pretty convincing show of not wanting anything to do with him, and yet he persists. Come to think of it, this woman’s always pushing guys away --- remember To The Shores Of Tripoli, The Quiet Man, all those costume shows where she’d rather run the man through with a sword than go to bed with him (and don’t forget the time she gave Brian Keith that wicked black eye)? Man, I would just give up. So long, baby, it can’t be that good! 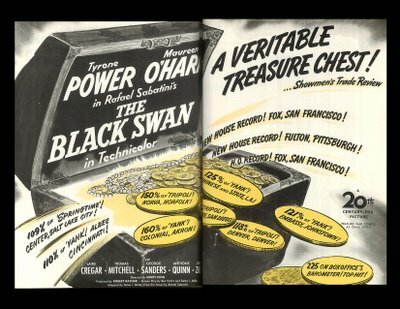 The veritable treasure chest referred to in a trade ad shown here amounted to $5.7 million worldwide. There was $2.5 domestic, $3.1 foreign, and a profit of $2.3 million. This was the biggest money 20th Fox had seen in its history, and would not be surpassed until after the war and Leave Her To Heaven. 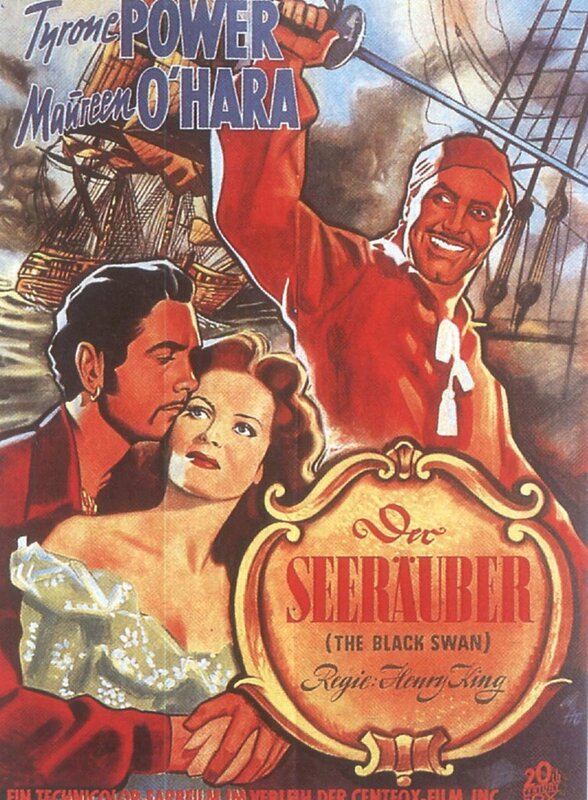 George Sanders miscast in THE BLACK SWAN? I must respectfully disagree. It was different casting but Sanders was a lot of fun in the part. 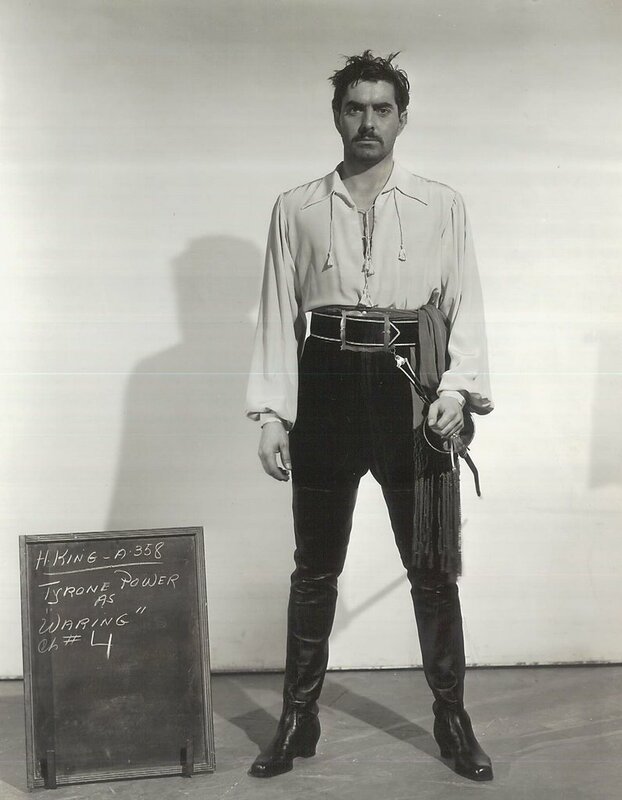 The fact that George Sanders was a hulking 6'4" was seldom used in his films but when he threatens Tyrone Power you reallly don't want to bet on Tyrone's chances. Of course I haven't seen this film since they would run an original nitrate, IB technicolor print at the Vagabond Theater out here in LA. I assumed that the owners of the Vagabond had an under the table arrangement with some friends at UCLA's film archives since so many of the prints (this is from 1977 to the early 1980s) had the archive's logo spliced on at the head. I hope the transfer is better than the transfer of THE ADVENTURES OF ROBIN HOOD that TCM ran a week or so ago. It looked like bad Cinecolor. The 1980 single strip negative looked vastly better. I had actually seen an original nitrate, IB technicolor print not too long before I saw the 1980 single strip and it's pretty darned close. Hi Jim --- Always great hearing from you. Check out Spencer Gill's comment above. He saw a 35mm nitrate print. It must still reside with UCLA. I was frankly let down by the color in "The Black Swan". I used to have a 16mm print from those same CRI elements they used for this transfer, and if anything, it looks as though they've deteriorated in the interim. Problem is that these appear to be the only elements they have left, the original three-strip negatives having been junked many years ago. It still looks acceptable, though a long way from definitive. I cannot say anything definite about the survival of IB Technicolor prints but I would like to throw this query to the various board denizens. Much (if not all) of Fox's Technicolor stuff was actually shot on the old Kodachrome stock. The Kodachrome reversals (often shot in the full or silent aperture) were then reduced to academy at Technicolor which shot black and whire seperation negatives. You would assume a massive contrast build-up but there were two factors involved. First of all the old Kodachrome professional stock wasn't as high contrast as the later Kodachrome 2 used by consumers to shoot slides. Secondly, since black and white duplication always used a very contrasty positive this would pretty much of take care of itself. Add to that the flatness of both the lighting in Technicolor (an amazingly contrasty stock to begin with) and the careful compression of tonal range (shirts were never white but pearl gray, makeup was quite dark, and sets were painted pretty dark as well) that would take care of a lot of problems. Anyway, forgive the long lead-in, if the Technicolor elements are too shrunken to match up with each other I wonder if the original Kodachrome still exists? I have some 1937 vintage home movies shot on Kodachrome and they're totally unfaded and in great shape. For new elements a new negative could easily be shot onto 5272 (alas, the most expensive stock Kodak sells at $1 per foot) using a wet gate. If the perfs are too shrunken the dupe could be done contact, continuous wetgate (where the perf shrinkage wouldn't matter) and the reduction could be done from the dupe negative. I have to disagree about Power. 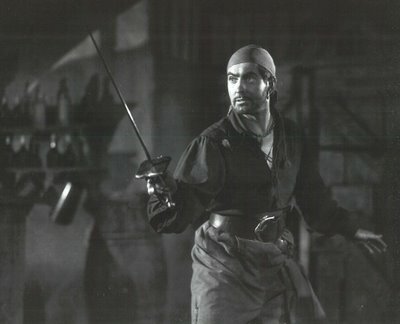 First of all, I thought he was excellent in Captain from Castile. Secondly, when he died he was still an international star with top billing, unlike Errol Flynn. In fact, he turned down Witness for the Prosecution and only took the part when he was offered an obscene amount of money and percent of the gross. Yes, he changed during the war, but he continued to make popular films.